Denominator for “spending greater than 30 minutes in sun” includes all children; denominator for all other sun protection behaviours includes only children spending at least 30 minutes in the sun. 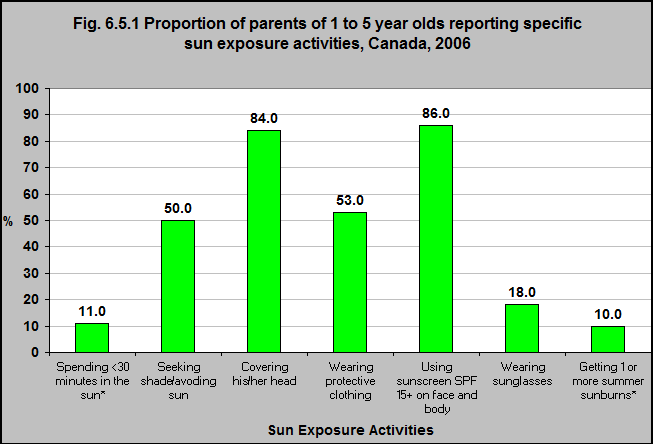 Source: CICH graphic created using data adapted from Sun Behaviour in Canadian Children: Results of the 2006 National Sun Survey. Pichora, E.C., & Marrett, L.D. In 2006, only 11% of parents of 1 to 5 year-olds reported that their children spent <30 minutes in the sun. Of the children who spent more than 30 minutes in the sun, the majority of parents covered their children’s heads (84%) and used sunscreen on their faces (86%). Only 10% had one or more summer sunburns.